Really glad to see you got rid of the zones. They are a liability now that there are quite a few intricacies with price and 'special zones'. Good riddance! Shouldn't the Liverpool St National Rail services leave from the National Rail station and not the Crossrail station? Apologies if I've missed something here. The map doesnt show any National Rail lines, only TfL ones. The nearest it gets are the Overground and Elizabeth Lines and these interchange at Liverpool Street as shown on the map. XR2 is also shown but this doesn't interchange at Liverpool Street. I assume that the comment actually relates to the Overground services to Chingford etc which are shown arriving into the Crossrail blob rather than the LU blob (where the NR interchange symbol is). I always view the blob (with however many nodes) as one overreaching interchange, purely for the convenience of aligning the graphics correctly on what is a topographic diagram. There are many instances of double and triple blob interchanges on the diagram, and I wouldnt read them any differently unless it specifically showed it to be so, like Monument and Bank for example. I'd love to see the Croxley Link in as 'under construction' and the Northern Heights as 'closed for electrification' or even some other accurate designation, such as 'closed because DfT think buses will suffice'. Also, what software is used when making this map and is it easy to use? Thank you I'd considered doing a joke map where everything would be linked up by interchange blobs. I'd try to have the new interchanges be as logical as possible, even if they'd never be built in real life (e.g. Warren Street - Great Portland Street, Queensway - Bayswater, Bank - Cannon Street). But interchanges are very difficult to arrange in tube-map-style, because of the many graphical restrictions on interchange connectors. 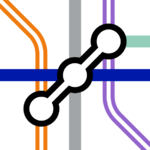 Like Tube lines, they may only be horizontal, vertical or diagonal; unlike Tube lines, they aren't allowed to bend; a Tube line can't run directly underneath an interchange connector line in the same direction; it's also considered bad form for a Tube line to change direction directly underneath an interchange blob. My other main reason for omitting the zone interchanges is that for many of the extensions it's not clear which zones the new stations will be in. I think it's very possible that by 2040 the fare zone system will have been overhauled entirely. I'd be amazed it's not possible to use contactless cards on the whole National Rail network by 2040, given how ubiquitous contactless payment is everywhere else. I also have to confess that fare zones are very fiddly to draw. I chose not to include the step-free access icons for similar reasons: it's very hard to predict where step-free upgrades will happen, and they cause a lot of clutter. My main inspiration for laying Liverpool Street out this way was the official Elizabeth line map which has Overground and Crossrail sharing a blob between Liverpool Street and Moorgate (but it did put the Liverpool Street label on top). There was a discussion that came up on the RailUK forums about where the Thameslink line would go through Euston-Square-Euston-King's-Cross-St-Pancras, were Thameslink to be included on the tube map. Having Thameslink and Crossrail 2 share a blob is most convenient graphically, and has some justification physically (the Crossrail 2 station is roughly between Euston and St Pancras Thameslink), but objections were raised about that arrangement making Thameslink look too close to Euston. It's a difficult art! I'm very strongly considering making an "alternate universe" Tube Map of all the proposed and planned lines and extensions that never happened. If I made that, the Northern Heights would definitely appear. I made the map using Inkscape. I hadn't used it at all until a couple of months ago, and I felt it was relatively straightforward to pick up. I've always considered that Beck got this (more) right on his maps - one ring per railway, in line(s) colour. It defies logic that in the official map, Finchley Road is shown as a similar interchange to such OSI's as Canary Wharf, Bow, Hackney, and the 'air line'. Likewise, Ealing Broadway/CX/Rayners are all very different interchanges - not hinted at by the single blob. Really not a fan of the official map as its ill-thought out, and full of needless kinks and confusing ambiguities. I'm for anyone who has a fair crack at redrawing it, whether that be in 'thermos' style or something more radical. Good for you. This came up about a decade or more ago on the long-defunct 'The Transport Forum'. By the end it got bogged down because the consensus of what constituted a legitimate claim to appear on the map was... disputed. Schemes that have had detailed planning, schemes that have received royal assent, schemes that broke ground? If the first, then you start dealing with multiple options as whims change through the decades with long/delayed projects; the prime example being all the Fleet/River/Jubilee variations, Chelney being a solid contender too. If you choose Royal Assent as being the criteria, you get about 6 schemes from the late 19th century boom that have since been covered by later projects, so would be considered mutually exclusive to something that exists. If you choose 'broke ground', you get Lothbury and the Northern Heights, but not Denham (which appeared on the map) or the erstwhile extension of the Aldwych shuttle to Waterloo. Thats all before you deal with line colours! Stanmore has had Met, Bakerloo, and Jubilee service. But it also enjoyed briefly a service to Upminster, and what if you include the Fleet line too? Messy messy messy! And headachey! Where do you draw the line with the former 3 or 4 ways to Windsor? Interesting you use inkscape. Have you used Illustrator, if so could you comment on how they compare? I'm for anyone who has a fair crack at redrawing it, whether that be in 'thermos' style or something more radical. As recommended on here, Inkscape is your friend Ben......Inkscape Link. Let's say a week tomorrow for delivery of your magnum opus! Good for you. This came up about a decade or more ago on the long-defunct 'The Transport Forum'. By theend it got bogged down because the consensus of what constituted a legitimate claim to appear on the map was... disputed. Schemes that have had detailed planning, schemes that have received royal assent, schemes that broke ground? If the first, then you start dealing with multiple options as whims change through the decades with long/delayed projects; the prime example being all the Fleet/River/Jubilee variations, Chelney being a solid contender too. If you choose Royal Assent as being the criteria, you get about 6 schemes from the late 19th century boom that have since been covered by later projects, so would be considered mutually exclusive to something that exists. If you choose 'broke ground', you get Lothbury and the Northern Heights, but not Denham (which appeared on the map) or the erstwhile extension of the Aldwych shuttle to Waterloo. I completely understand what you mean. I think my strategy would be, wherever there was some dispute, just to plough ahead and make a decision. I had to do that, to a lesser extent, with the 2040 map. Should the Croxley link be included? What about Overground devolution in South London? What should the Old Kent Road stations be called? Should Crossrail 2 be via Balham or Tooting Broadway, or should the map show both options (same for Wood Green and Turnpike Lane)? Should I start speculating about Heathrow expansion? What colours would a split Northern line be? Anyone else making a map like this would make different calls, but just being able to say "here's what it could look like" is interesting enough. Similarly even though an alternate-history map might involve a few arbitrary choices and a few educated guesses it could still be very cool. I've not ever used Illustrator, unfortunately - I simply chose Inkscape as a free alternative. Illustrator could well be a lot better! Ah yes. And I think that's important. If you put the BR sign on the same node then it makes sense (IMHO).